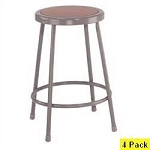 This is a heavy-duty 24" lab stool with adjustable height inserts. Q: Can these stools be adjusted to different heights? Fast Shipping: Orders for the National Public Seating 6224H (32 PACK) generally leave the warehouse within 2-4 business days. Dimensions: 144" x 54" x 18"